The fuel shutoff on the B2 models and previous versions is on the floor just in front of the collective. They’ve had issues with passenger bag straps catching on the lever and pulling it back. Eurocopter now has a plastic guard to help protect this from happening but obviously still happens. 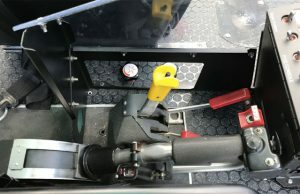 They could also catch and yank the throttle to the cutoff position as well. on the B3s and EC130s it’s now on the ceiling above your left shoulder. You wouldn’t think it be easy but passengers are always dropping their handbags and camera cases between the seats. Unlike airplanes, helicopters do not naturally float. Therefore if they are operated over water it is conventional to have pop-out floats that a pilot can activate via a button on the collective pitch control. This is supposed to be done right at the bottom of the autorotation as the helicopter rushes toward the water. The pilot, Richard Vance, should not be faulted for the helicopter flipping upside down. In theory it might be possible for a pilot to do a perfect autorotation and land with zero forward velocity and then float like a boat, but in practice getting the pop-outs popped and landing gently enough for the helicopter to remain intact is an achievement. After that it is generally recognized that escaping from the flooded helicopter is not something that a typical person can do without training. People who fly regularly in helicopters (or even light airplanes) over water, e.g., offshore oil rig workers, may be required to take a water egress survival course (example). Escape was made more challenging in the case of this New York City crash because the passengers were in harnesses for doors-off photography rather than in conventional seat belts with a single-button release. 2018 has been off to a sad start for American helicopter enthusiasts (see also this Newport Beach R44 crash). However, at least one crash resulted in minimal injuries and a cautionary lesson for the rest of us. I have resisted adding an iPad or similar to our helicopter panel and workflow. It is painful to fly with certified in-panel avionics that were already obsolete when designed in the 1990s, but I fly VFR-only in the helicopter and want to be looking out the window. I’ve also avoided doing any kind of agricultural work due to a feeling that it is an accident waiting to happen. Maria Langer, a thoughtful and experienced pilot, combined iPad and ag flying and lived to write about the resulting crash. The video showed what looked to an untrained observer like a not-terrible autorotation. Next time I get in a harness, I’m going to make sure I can get it off easily! Swimming in 40 degree water is no picnic, but it beats being trapped in a helicopter. I imagine they’ll be adding all kinds of plastic guards around these switches now. Who signed off on these no doors for tourist literally strap them to the helicopter itself tourist rides? Did the FAA sign off on that? Everyone in that chain should be fired or prosecuted. Under the US Constitution 1st amendment, no laws may be passed restricting freedom of speech. So if I am a reporter on the way to cover a story I don’t have to obey the speed limit? Am I allowed to run pedestrians over too? Can I break into your house to search your files for my story? Being a reporter doesn’t give you immunity from laws concerning safety or other matters. Doors off photo flights aren’t unusual or very dangerous, normally. I’d say more photoflights are taken from helicopters with doors removed than vice versa. Mark: This was not an ordinary photo flight using the factory seat belts. They had special harnesses to enable sitting with legs outside of the ship. These harnesses lacked a one-touch quick-release that a factory seat belt would have and instead had to be cut away with a knife in the event of an emergency. See https://untappedcities.com/2017/07/07/literally-hang-out-of-a-helicopter-on-photo-tours-of-nyc-from-flynyon/ for some photos of the harness. Safer in terms of keeping people from falling out through the open doors, but likely harmful in this accident. I’d like to see how the actual belt harness was attached to the helicopter interior. It’s hard to believe that a harness with enough slack to allow one to lean out of the helicopter cannot also be reached by the individual to unhook without much difficultly. One possible issue is the fact that the helicopter quickly inverted in dark, freezing water. It’s hard to get out of a conventional seatbelt when you’re hanging upside down in an aircraft in cold, dark water. Concerning the rollover, the Robinson POH advises to go full lateral cyclic on ditching in order to stop rotor blades from cutting you to pieces while exiting as the ship settles into the water. However, this probably should not be done and doesn’t make sense on a ship equipped with pop-out floats. Concerning the passenger harnesses, I’m guessing this was an “Instagram” flight with amateur photographers. I don’t care how many times you brief customers such as these, all they want to do is take pictures with their feet hanging outside the ship. They pay no attention to the safety briefing. As Robinson POH also advises, photo flights are dangerous but not necessarily for the reasons discussed in the Safety Notices. How does a bag go from the back seat pull the fuel cut-off lever back? From the pictures I’ve seen, the yellow flotation bags deploy to far below the center of gravity of the helicopter. This makes capsizing too likely.